How sure are we that Russian Kettlebell - 28kg (62 lbs.) will work for you? Simply fill out the form below and put Russian Kettlebell - 28kg (62 lbs.) to work for you right now. 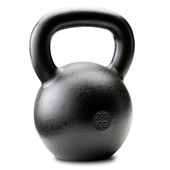 Obviously, we would go out of business if Russian Kettlebell - 28kg (62 lbs.) didn't work, the way we said, right? 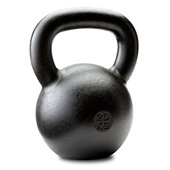 With the promise of a full refund if you're unsatisfied, you have nothing to lose by trying Russian Kettlebell - 28kg (62 lbs.). Go ahead and try it today. 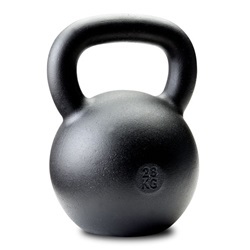 For some men, jumping straight up to the traditional next size, the 70lb kettlebell, after they have mastered the 53lb model, can be daunting. The 62lb kettlebell allows the already strong to hone new strength skills and develop exceptional conditioning, before they step up to the full rigors of the 70lb job. 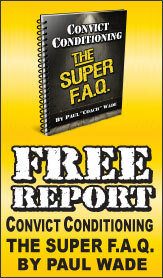 Recommended companion resource: the classic book and DVD, Enter the Kettlebell!.. 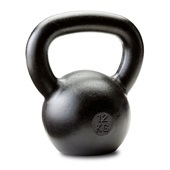 If I could, I'd rate the Russian kettlebell not at a ten-- but at a twelve. I wish I'd been introduced to these things 40 years ago. As a former boxer and division one rower, I can say beyond all doubt that I could have hit harder,lasted longer, and decreased my rowing times by TENS of seconds. You owe it to yourself to educate yourself on their use, and make an investment. Dragon Door kettlebells are the best on the market and well worth the money. I started out with 35lb kettlebell from Dragon Door, progressed to 45lb and then 53lb and now am using the 62lb. I love these things! This KB looks rugged. I have bought cheaper ones and they get dinged up over time. 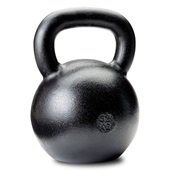 The Dragons Door 28KG Kettlebell is solid and looks like it will never get damaged. The handle is wide enough to do 2 handed swings comfortably. I also like the thickness of the handle. The handle does not tear up my hands like the cheap ones do. I will be buying more kettlebells from Dragon Door. 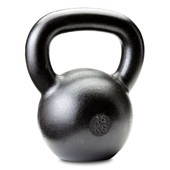 These are the Cadillacs of kettlebells. I received the Russian kettlebell from Dragondoor and was immediately blown away by the workmanship and quality. I honestly had trouble believing that this was cast KB, it was so smooth, at first I had to look twice to make sure that it wasn’t milled. I picked the KB up and did a few hand to hand swings, a few two hand swings and one hand swings. Felt great, but then I decided, let's test the balance with a few KB snatches. I am an old Olympic lifter wannabe and I don't swing my snatches, I explode straight up off of the ground and pop them through at the top. First rep and I was extremely impressed and very happy, this KB has unbelievable balance very smooth and very cool. 5 sets of ten later and I was worked out, winded and happy. I have used quite a few of the other KB's out the on the market, but this Dragondoor RKB is built like a tank and handles like a sports car. I can’t say enough about the quality of this RKB, you can probably find a cheaper KB, you might even find one that is not black, but you won’t find any with this quality and feel of the Dragondoor RKB. I have been lifting since 1960 and bought my 1 pod, 1 ½ pod and 2 pod sets a number of years ago from DD, they have a tremendous product and are a tremendous company, Bottomline they are QUALITY with a capital Q. The 28kg is my sixth kettlebell from Dragon Door. Cheap? No. The best? Absolutely. This weight is a not too steep an increment from the 24kg. Definetly heavier, but not a 30% increase in weight as the 32kg would be. I'm working up to that one. This is the best exercise format around if one were to ask me. I know it's a subjective thing, but I am sold. I am into my sixth decade on this planet, and have never felt better, (that I can remember). I have been buying Dragon Door Kettlebells since day 1. It must about 10 years or so by now, and I've gotta say, these bad boys are built to last. I know they will last me a lifetime and I will pass them down to my kids. There's a reason they say, "You get what you pay for." These bells are top notch, period! I have a couple dozen kettlebells now from several different brands. This 28kg from Dragon Door is easily my favorite bell. No other brand compares to their finish. Rated 10/10 Another great product. This is my 6th Dragondoor RKC kettlebell, so the excellent quality was no surprise. I was having difficulty making the transition from 24 to 32 kilos, especially with the press. 28 has given me just what I needed to move on. I feel better now at 53 years of age than I did at 35, thanks in large part to these "cannonballs with handles" and Pavel's Simple and sinister plan and the RKC DeepSix routine. Chasing elk around the mountains of Montana is much easier than it used to be.